DanaSchmoyer.com » Blog Archive » Welcome our little baby boy! 17 May 2010 Welcome our little baby boy! Today has been such a fun day! First Hannah had her 9 month check-up. She is in the 84th percentile on height, measuring in at 28.75 inches, 57th percentile for weight at 19lbs 6oz, and 89th percentile with head circumference at 18 inches. The doctor said she looks completely healthy and is on track developmentally. Yay for Hannah! And then half an hour later we got to go see Hannah’s little brother! I even wore blue ’cause I had a hunch God is giving us a boy this time. I had no clue with Hannah, which made it easier with keeping her a surprise. 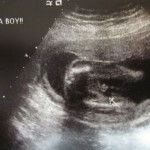 Baby boy was very active for us on the ultrasound moving around like crazy while the tech tried to measure everything. And then when she was going to let us have fun looking at him he decided to take a nap and wouldn’t move no matter which way I laid. So far it sounds like we’ll have another good baby like Hannah. Our doctor said that my placenta is on the top, so that would explain why I’ve had a hard time feeling Baby Boy move with my hand. He is an active baby, and I enjoy the movements I can feel internally, but it’s so fun to share the movement. 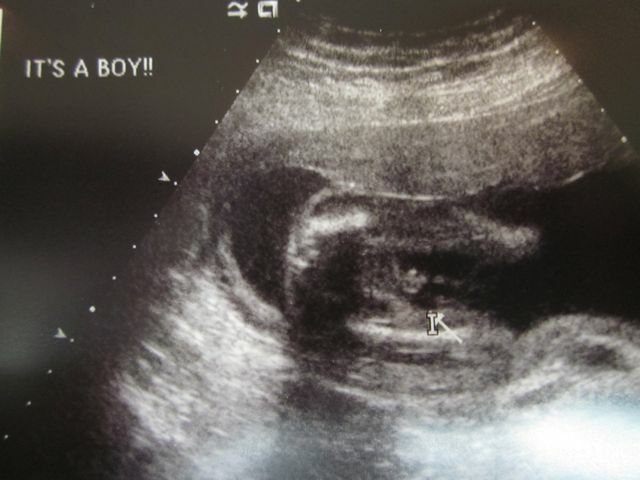 I am super excited that we’re having a boy! I wanted a girl first ’cause I was a little nervous about trying to raise a boy first, and felt comfortable with a girl since I kinda had practice with having Katelin as my little “real life doll” growing up. I’m still a little nervous, but am excited about all the fun a boy will bring to our little family. Now I just want to spend the rest of the evening getting things ready for Baby Boy! Only 20 more weeks! How exciting that you will have a little girl and boy! God has really blessed you! Now Candi is joining you in this lineup! !